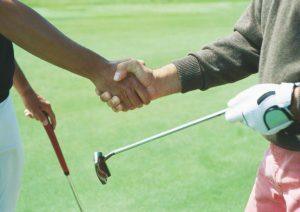 Whether you’re a beginner or you’re an experienced player in golf, learning and understanding golf etiquette makes you enjoy the game. Golf etiquette may not be formal or standard rules, but these set of practices help you minimize the damage to the golf course and equipment. But what are examples of golf etiquette you should observe? As a good player, ensure that you replace your divots. If the turf explodes upon impact, replacing the divot is difficult. So, use your shoe toe to kick in the turf around the divot edges. Use the provided soil or seed mix to fill in the divot. Enter the bunker from the low side, and rake the area you played from after you hit your shot. Additionally, repair any indentations caused by the ball when it hits the green. Always carry a tee, knife, or any other repair tool to help you with the repairs. Displays of frustrations are common on the golf course, but take care to keep your temper under control. Never yell, scream, or make a fool of yourself. Throwing clubs or putters is dangerous to yourself and other people on the course. You may even be disqualified or land yourself in court when you go against the simple rules or hurt others. Do you hate losing? If you lose, be a true sportsman and congratulate the winner. Be sure to stand in a place that doesn’t distract another player. Fact: unlike hockey, golf is definitely a no-contact sport!, but still, you should avoid moving when the other player is preparing to putt. Watch out for your competitors or partners’ putting lines (imaginary lines that link the ball to the hole). Don’t step on these lines. Mark your ball if it lies on another player’s line. Last but not least, be sure to stand alongside and not behind the person who’s playing. Should the player ask you to move, honor their request. Remember not to make noise when another player is playing. Do you feel annoyed when other players distract you with their carts and equipment? Always park your cart on the designated cart paths. Carts may inflict wear and tear on the turf and can cover or move another player’s ball. Never place your bags and clubs in front of the green where they’ll distract and annoy approaching players. If the course allows you to place your equipment off the paths, make sure that you observe the 90-degree rule. When backing up your cart, set the parking brake and keep the noise to a minimum. Are you the slowest player? When it comes to playing golf, honesty is paramount. Ensure that you evaluate your pace and admit it if you’re the slowest player in your team. Allow faster players to go first and encourage everyone to move quickly so that you’re right behind the group. But even if you’re slow, don’t be the slowest. Always be prepared to play when it’s your turn. Plan for your next shot by studying the direction and strength of the wind. When it’s your turn and you’re not ready to play, allow your fellow players to go play. Also, take less than five minutes to search for your lost ball.